How retailers can generate more value – both financially and environmentally – by examining the design and construction of store remodels. For the majority of retailers, the word “sustainability” is used interchangeably with “operational efficiency.” Not making the distinction between these unique concepts is a justifiable misunderstanding because although they aren’t direct synonyms, they are related. In my opinion, it is never too late for a brand’s leadership to expand its focus beyond a bottom-line mentality (operational efficiency) and amplify its efforts to preserve natural resources (sustainability). One way retailers can become more sustainable is by examining the design and construction of stores, specifically remodels. New store development accounts for only two percent of the total retail building in the United States.1 From this statistic, we can conclude the majority of greenhouse gas emissions emitted from the retail sector are not from new stores, but rather existing stores. Undertaking an initiative to maximize the efficiency of existing equipment and systems not only improves a building’s performance, but presents the ideal set of circumstances to implement a clean fuel source such as solar. Taking the extra step to integrate clean energy during a store remodel reduces reliance on fossil fuels and other nonrenewable resources for future generations. From MG2’s experience, large brands typically remodel stores every five to ten years. 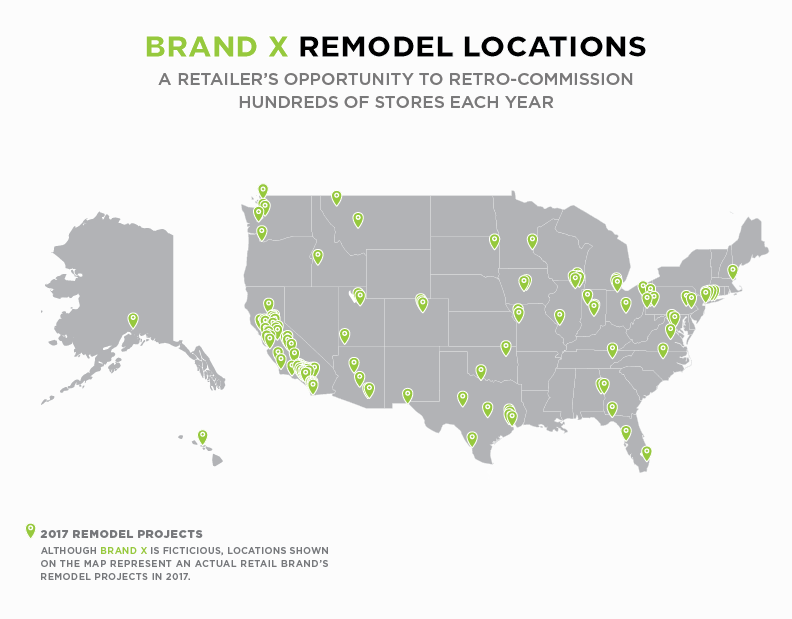 With the top 100 retailers operating between several hundred to tens of thousands of stores globally, this equates to hundreds of thousands of stores being remodeled on an annual basis.3 Remodels subsequently present significant opportunities for retailers to reduce reliance on natural resources, minimize energy consumption and produce less waste. Changes made during a store remodel typically consist of aesthetic and planning updates to keep the store on-brand and up to code. I strongly encourage retailers to consider incorporating retro-commissioning into remodel projects as the decision requires minimal cost and yields high energy savings. 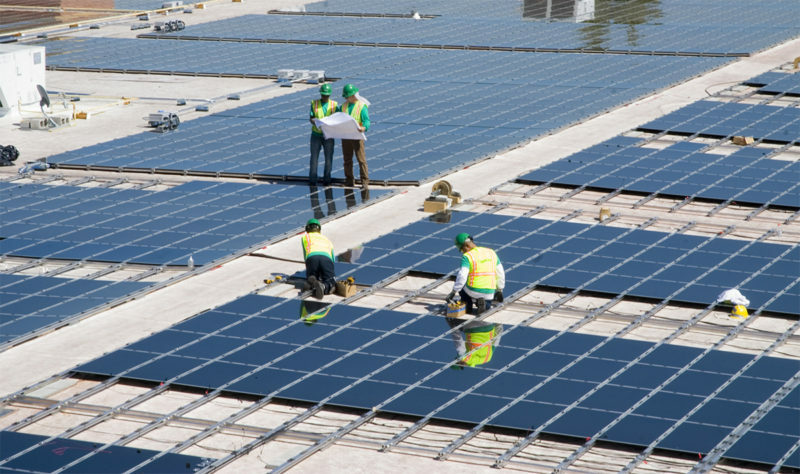 Adding solar panels to a store’s roof not only reduces greenhouse gas emissions, but also increases the store’s energy efficiency by 40 percent. Retailers that do not have control of their roof space can instead opt to purchase renewable electricity from their local power company. If the power company does not have green energy options available, the retailer can choose to buy carbon offsets or renewable energy credits through a third party. Solar power generating system being installed on the roof of a large-format retail store during a remodel. By monitoring water consumption around the clock, building managers can identify the fixtures that are least efficient and what building systems and equipment require upgrades in future store remodels. Systems like APANA create a positive feedback loop, promoting the implementation of low flow fixtures and reducing potable water consumption. Thanks to initiatives like Declare, GREENGUARD and Cradle to Cradle, it has never been easier to research and buy green materials. Choosing a Cradle to Cradle material ensures the product was sourced sustainably and is not thrown into a landfill after its usable life. For example, certain manufacturers design carpet tiles capable of being reused once a commercial client is done with them. The yarn and other fibers are separated from the backing, producing two main material streams that can be recycled to make new high-grade products. Green materials can also improve the indoor environmental quality of a space. A retailer that chooses to buy a Reveal product can take comfort in knowing their purchase does not contain “worst in class” Red List components in its chemical makeup. Utilizing Reveal products is especially important for store finishes, as consumers and employees directly interact with those elements on a daily basis. By requesting a nontoxic material, a retailer can improve indoor environmental quality, which can have resounding effects on people’s health and happiness. Labels to look for when researching sustainable building materials. Retail remodels should focus on three initiatives: reduce, re-use and recycle. In addition to specifying Cradle to Cradle finishes and optimizing material procurement, brands can help reduce the amount of waste by implementing a construction waste management plan for all stores. Debris generated from construction and demolition (C&D) activities is recognized as one of the largest components of the U.S. solid waste stream. The most recent Environmental Protection Agency Report found that 534 million tons of C&D materials are generated annually in the United States.6 These materials typically include concrete, asphalt, wood, metals, gypsum wallboard and roofing. In many states, the amount of C&D materials account for more than one-fourth of the disposed waste stream.7 A waste management plan would ensure all appropriate materials are separated and recycled either on or off-site. While there are many third-party companies a retailer can hire to haul off waste and divert it elsewhere, best practice is to have the general contractor separate recyclable materials on-site. By educating and emphasizing the importance of waste management to the general contractor, a retailer is helping promote environmental stewardship within the construction industry. It’s unrealistic to expect all retailers to “go green;” however, it is feasible for brands to begin specifying greener building equipment, systems and materials. With national and international brands operating millions of store locations, changing a single element in a retailer’s remodel cycle can have exponential benefits. These actions individually and collectively lay the ground work for future sustainable remodels. Whether a retailer is attempting to minimize its carbon footprint for cost-saving incentives, public relations goodwill or because it wants to put sustainability on par with profits, there is no advantage to judging whether an organization is making changes for the right or wrong reasons. When it comes to sustainability in retail, a step in the right direction is always positive. Sustainability optimization in store construction and design is a first step to take toward bettering our planet. Cecilia is a member of MG2’s Retail studio and is a co-chair of the MG2 Sustainability Forum. She earned her Bachelor of Architecture and Master of Architecture in Sustainable Architecture from the New Jersey Institute of Technology.